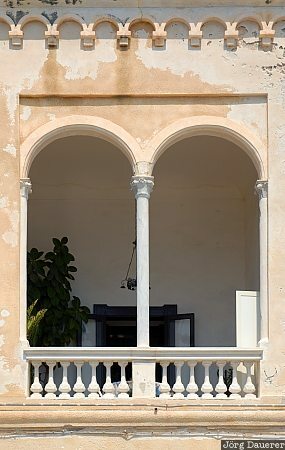 Balcony with a central column and a nice balustrade all part of the facade of an old building in San Cataldo on the east coast of the Salento peninsula in the province of Lecce, Apulia (Puglia), Italy. This photo was taken on a sunny day in April of 2006. This photo was taken with a digital camera.